Guy Maurille Massamba is a Faculty Associate with the Arizona State University where he teaches the course Technology and Political Development in sub-Saharan Africa. He moved to the United States in 1993 to continue with graduate studies in Political Sciences and International Political Economy. Before completing his Master in 1995 and PhD in 2000 in the United States, Guy had already obtained a B.A in Philosophy, a B.A. and a Master in Theology from Jesuit schools in Africa and Canada. His educational background also include graduate degrees in International Relations and Anthropology from the Catholic University of Louvain, in Belgium. 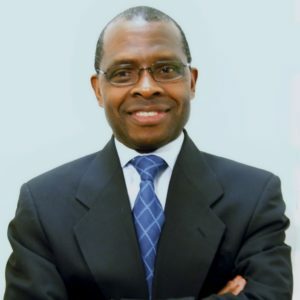 From 2000 until 2010, Guy worked as a Consultant for the World Bank, in the field of capacity building and governance, giving training to African national and local government officials and civil society organizations in project development and management with emphasis on results and leadership accountability. The professional experience at the World Bank also included Monitoring and Evaluation and strategic reviews of projects conducted by African government ministries and departments and civil society organizations. A similar work was performed for Development Alternatives, Inc, focusing on strategic project review, and for the African Union with a perspective that instilled public administration reforms. Since 2013, Guy has been working as an Expert Democracy Analyst for the University of Gothenburg, Sweden, in a democracy analysis project that received the 2016 Lijphaert/Przeworski/Verba Dataset Award for best dataset in comparative politics.